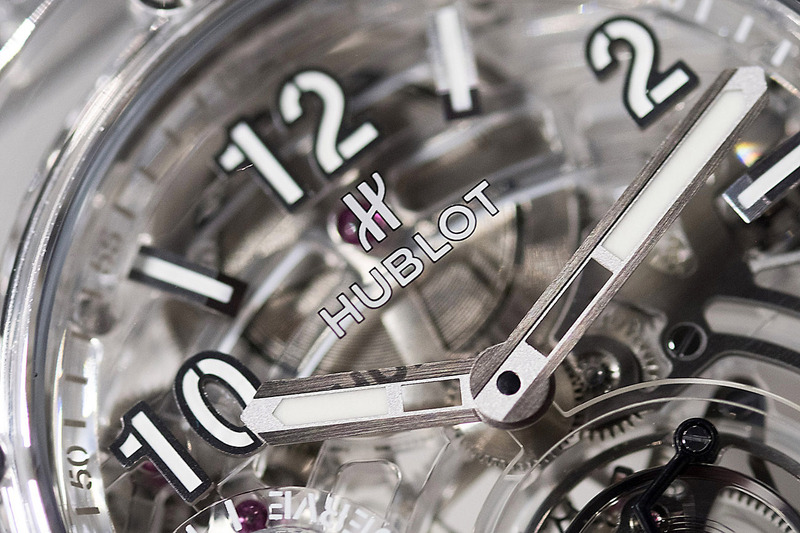 One of the biggest surprises of Baselworld 2018 was the Hublot Big Bang Tourbillon 5 Days Sapphire. 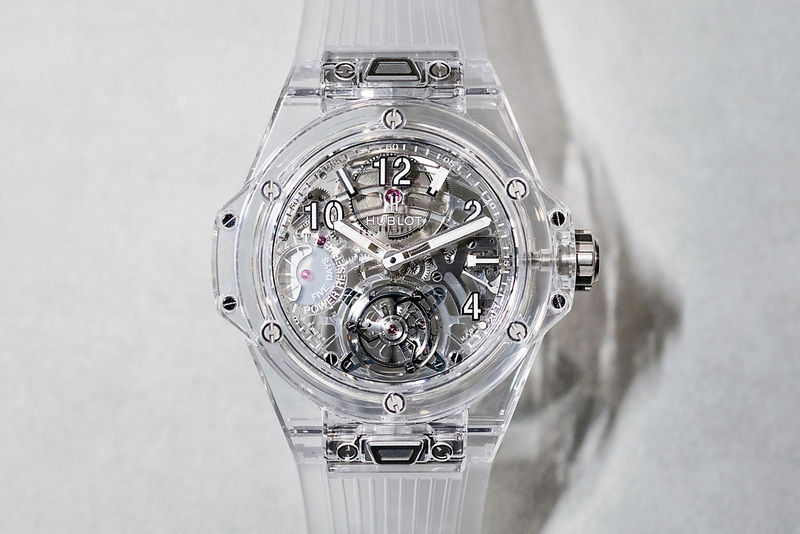 This transparent watch is the latest iteration of the Big Bang Power Reserve Tourbillon 5 Days, it’s just the first time the watch has been rendered in sapphire crystal, a material concept first explored by Hulbot back in 2016. 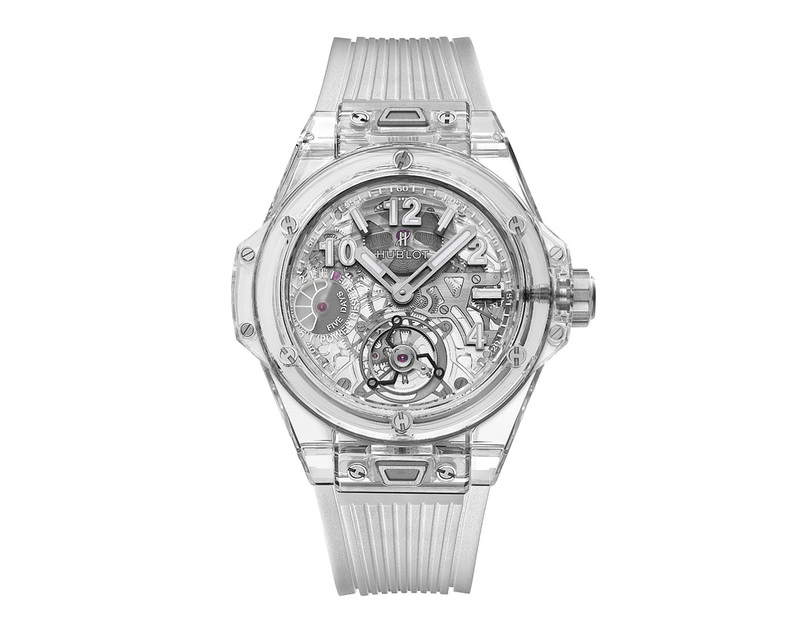 It’s also similar to Bell & Ross BR-X1 Skeleton Tourbillon Sapphire Transparent Watch. 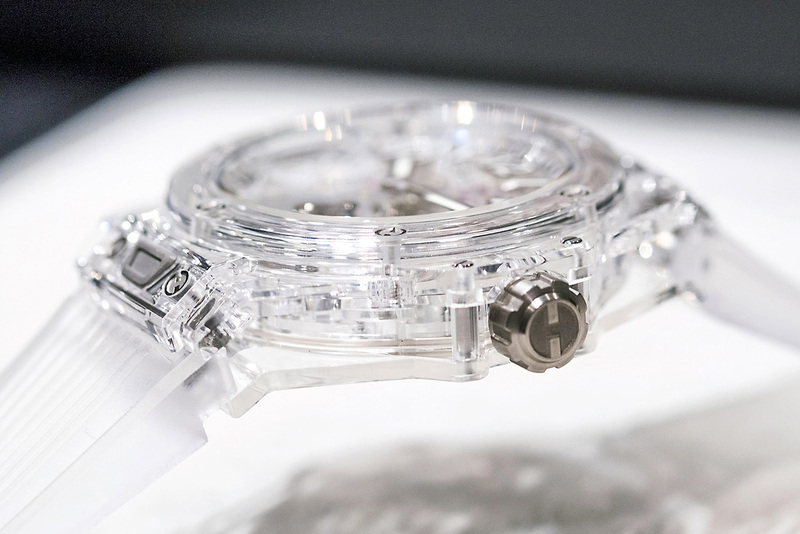 The case of this watch measures 45mm across and 14.25mm thick. The entire case is made from plates of sapphire that are first cut from solid blocks and then milled and polished down to the correct shapes. This houses a skeletonized resin dial with a rhodium-plated brass handset and oversized luminous Arabic numerals, combining for a harmonious look. 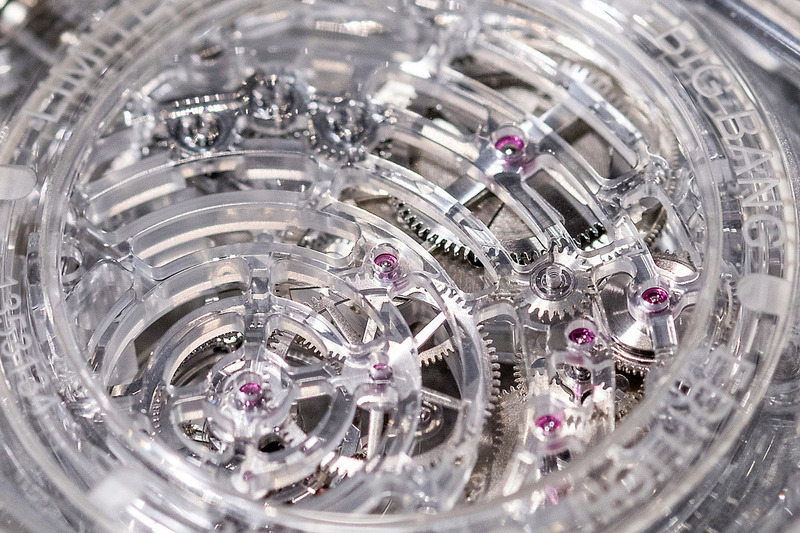 The movement powering this watch is the caliber HUB6016, which is an in-house, manually wound tourbillon with a massive 115-hour power reserve. In case you’re keeping track, that’s actually 4.79 days, not a full five. This is not a new movement, but rather a variation on the one used in the previous Big Bang Tourbillon 5 Days models (such as the Magic Gold version). However, this time the main plate, with its concentric circle bridges, is made of acrylic, continuing the transparent theme throughout. 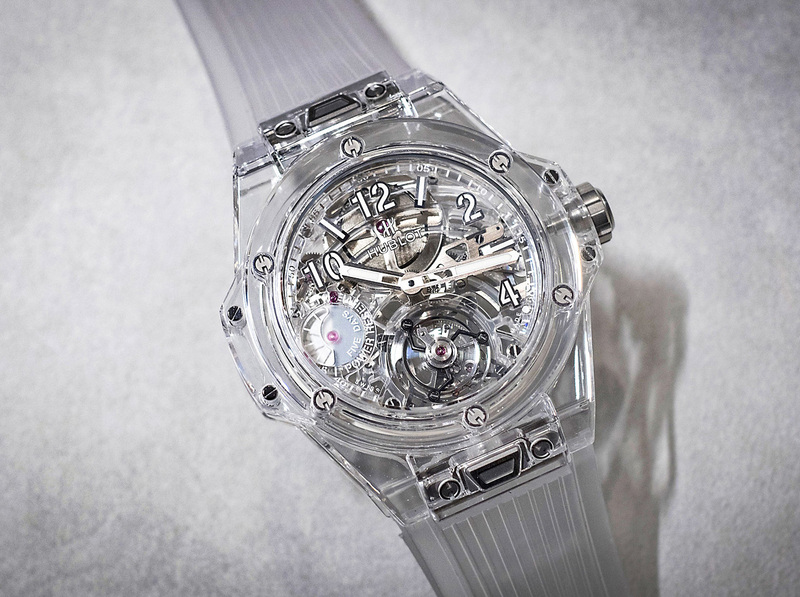 The Hublot Big Bang Tourbillon Power Reserve 5 Days Sapphire is limited to a series of 99 pieces and is priced at $148,000. There is also a version with a diamond-set bezel available for $190,000, also limited to 99 pieces. Also don’t forget to check our list of the most luxurious watch brands for men.